• Dream Big Like Walt Disney, who shared the magic kingdom of his imagination with millions, or like Jackie’s sister, Kathy, who didn’t let a severe case of rheumatoid arthritis stop her from completing a walking marathon, see where your dreams can take you. • Work Hard As Jackie points out in her recollections of her dad’s early political career, working hard can be a surprising source of energy, and adopting an attitude of cheerful persistence will help you reach your goal. • Learn Every Day The key is to re- member that learning is a reciprocal process. You can’t be passive; you must be engaged. Come along on a visit to the acclaimed Ron Clark Academy in Atlanta to see how this principle works in action. • Enjoy Life And what’s the best way to do that? From the wisdom of the ancient philosophers to information from the latest scientific studies, the answer is the same: Be grateful for all your blessings and do something every day to show compassion and generosity to others. • Be True to Yourself It sounds easy, but it’s the hardest principle to live by. Discover what people from William Shakespeare to Henrik Ibsen to John P. Abizaid have had to say about this touchstone for an honest life. NEWT GINGRICH is best known as the chief architect of the Contract with America. A former Speaker of the House of Representatives, he has published eighteen books, including the bestsellers "Real Change" and "Rediscovering God in America," and most recently, "Drill Here, Drill Now, Pay Less." Newt lives in Virginia with his wife, Callista. The Gingrich family includes two daughters, two sons-in-law, and two grandchildren. 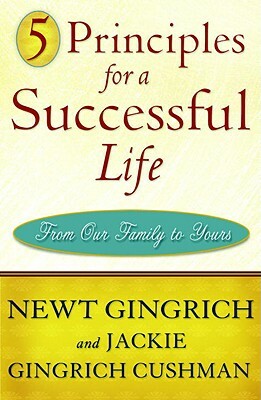 Visit www.newt.org. JACKIE GINGRICH CUSHMAN writes a weekly human-interest column for Townhall.com. Her nonprofit activities include serving on the Georgia Advisory Council: The Trust for Public Land and as president of the Learning Makes a Difference Foundation, which she founded in 2006. Jackie and Jimmy Cushman Jr. live with their two children in Atlanta. Visit www.jackiecushman.com.